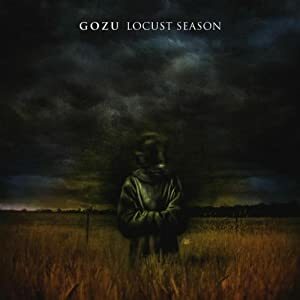 Heavy Planet : Heavy Rotation-Gozu-"Locust Season"
Gozu first appeared on the scene in 2008 with the the release of their seven track EP. Consisting of members of bands such as Wargasm and Triphammer, Gozu laid down the rock but also brought the groove on songs such as the human-empowerment anthem “Rise Up” and D.A.R.E.-baiting “Meth Cowboy”. Fronted by the man with a plan, Marc Gaffney, aka Gaff, who has the pipes Chris Cornell used to possess before he started modeling men’s cologne, Gozu plays the sort of rock tailor made to be blasted out on radio airwaves nationwide, ala early Queens of the Stone Age. It’s the kind of rock music that pulls up alongside you while you’re walking down the street minding your own business, demands that you “get in the f@*ing car”, proceeds to drive 90 mph down the wrong side of the highway, and then drops you off miles from home at some abandoned rest stop. After a line-up change which brought on board bassist Jay Cannava of Miltown and Clouds infamy, Gozu continues to chug along at its own pace. Axe slinger Doug Sherman peels off riffs and solos like they’re going out of style and drum god Barry Spillberg beats his drums like they owe him money, and the whole thing just cruises along on a bed of melodies most bands would die for. Small Stone Records snapped up Gozu in 2009 and the band is currently working on its debut for the label, which will no doubt leave many a listener scratching their head, wondering how in the hell Gozu does it and makes it look so easy. But don’t let your guard down, because next thing you know you’ll be on the outskirts of town wondering how you got there and what that catchy song stuck in your head is and where it came from." They aren’t shy about toying with pop sounds and quirky guitar lines, and that has earned them comparisons to Queens of the Stone Age, but Gozu are far more heavily toned guitar-wise than the Josh Homme outfit, whatever similarities of playing s t y l e might crop up. The vocals of guitarist Marc Gaffney are a point of commonality, however, and huge part of what sets Gozu apart from the pack. He is both soulful and well-enunciated, not losing sight of the fact that early Locust Season cut “Mr. Riddle” is a rock song even as he adds a second accent layer of higher-pitched vocals behind his straight-up track. He’d done the same thing on the catchy but wordless chorus of opener “Meth Cowboy,” and it appears at several other intervals, but as each track on Locust Season seems to have something to distinguish it from the others, that’s what does it there. “Jan-Michael Vincent” is perhaps the poppiest of the songs on Locust Season, at least in the radio-friendly sense of the word. It has some competition for catchiest track, especially from “Regal Beagle,” but at just under four minutes, the atmosphere is less weighty than in the chugging verses of that song, which is propelled almost frenetically forward by the rhythm section of bassist Jay Canava and drummer Barry Spillberg. “Kam Fong as Chin Ho” works some keys in with Gaffney’s and Doug Sherman’s guitars, perhaps appropriately evoking a television theme song while treading close on the edge of a misstep to derail the song and not quite crossing over. The organs on “Jan-Michael Vincent,” liberal ooohs and aaaahs throughout and spells of quirky bounce have already shown that Gozu can get away with plenty when they feel like veering from the norm. The swagger picks up and continues through the jam that eventually fades out on “Jamaican Luau,” with Spillberg’s performance just as much of a highlight there as the guitars of Sherman and Gaffney. The two six-stringers get their revenge on “Rise Up,” however, which is a (once again) catchy stoner rock song that makes heavy use of the space it has left for lead playing. “Rise Up” is something of a comedown from “Jamaican Luau,” and a relative drag point on Locust Season, since it doesn’t really add anything new that Gozu haven’t already presented on the album, but taken out of the context of everything around it, there’s nothing actually wrong with the track, it’s just a less than perfect fit where it is on the record. I can hear a lineage of Small Stone bands (Roadsaw, Dixie Witch, etc.) continuing and being refreshed on “Meat Charger,” on which Gaffney’s vocals are again a highlight. It’s easy to sound overproduced when slipping into and out of harmony with yourself, but he doesn’t, and in fact the elaborate arrangements only work to enhance the songcraft. One of the label’s many offerings to have been put together at Mad Oak Studios in Allston, MA, by engineer Benny Grotto, Locust Season definitely benefits from the professional-grade recording job it’s been given. As the slower-paced “Alone” (also the longest track at 7:56) closes out the album, the focus is less on catchy straightforward rocking or even adding new elements than it is on embracing that elaborateness entirely and giving the sound of the band over to it. The result is Gozu doing something different, but it also works with the eight tracks preceding. After the song has rumbled to a close, a little girl comes in to sing “Tomorrow” from Annie. I cannot condone artists putting their children on a record, but it’s easily-enough skipped in this age of technological wonder. They get a pass on it because it’s their first album and all the rocking and whatnot.